In this review, I would like to summarize and update you about some of the lectures and key points, that would deliver some of the messages and a bit of the overall experience, even if you weren’t there. 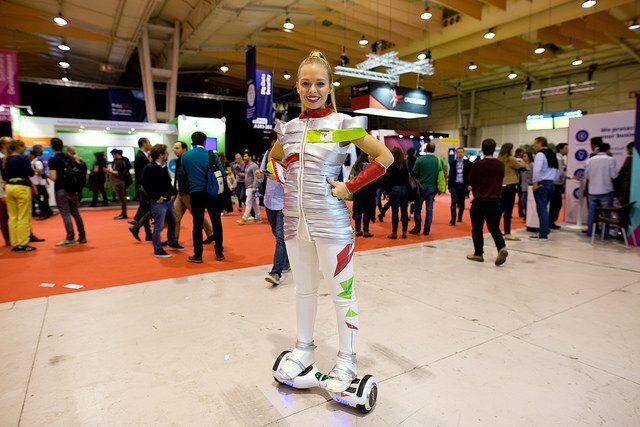 In short, WebSummit consisted of 21 conventions, in various fields. The fields included the more obvious web development and design, entrepreneurship and startups, to the less obvious sports, medicine and robotics conventions. Aside from the lectures and interviews held on spot, there are also alpha and beta startup stalls, features stage, networking areas and much more. 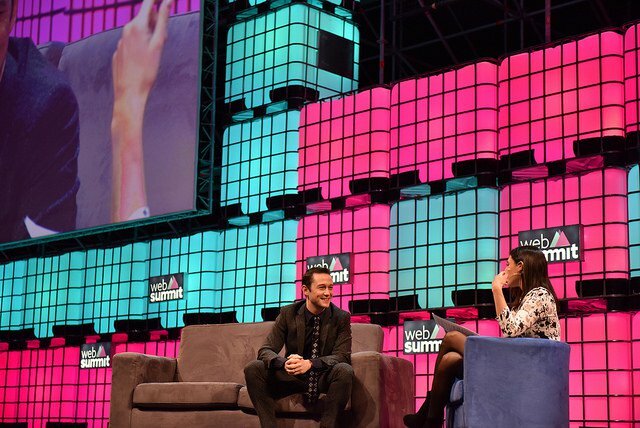 For me, the convention started in the afternoon at the main stage, with several key figures, such as the founder of WebSummit, the prime minister of Portugal, other government officials and even the actor Joseph Gordon Levitt (whom you probably remember from the movie Inception!). The topic was the new technological reality we all live in, while generating excitement and inspiration for all the other things due to come. Regarding Joseph, his conversation was with a leading financial reporter from CNN, and they talked about the connection between sharing and creating art, and their link to business, as reflected by the app that Joseph has spearheaded with his brother. It was fun to listen, and Joseph is obviously overflowing with charisma and personal charm. The formal beginning of the convention for me was the lecture of Facebook’s CTO – Mike Schroepfer. The topic: what is up Facebook’s sleeve not for the following year – but the decade. It seems that aside from Facebook’s declared goals, of connecting the entire world and generating links between people – they are fast at work on robots that control and crawl through this sea of information. Mike talked about creating interfaces (such as VR) that allow anyone to experience these friendships, close and far alike, as they were in the same room together. An artificial intelligence that allows to pick and image and an artistic style and mesh them into a picture that’s been drawn in that style already exists. But we’re not “there yet”, and it was explained using pizza. I’ll elaborate. Mike has shown a picture of a pizza on the screen, and whilst the audience could easily deduct that the pizza is not vegetarian, there’s no program that could detect this meaningful nuance, which says a lot about our current state. 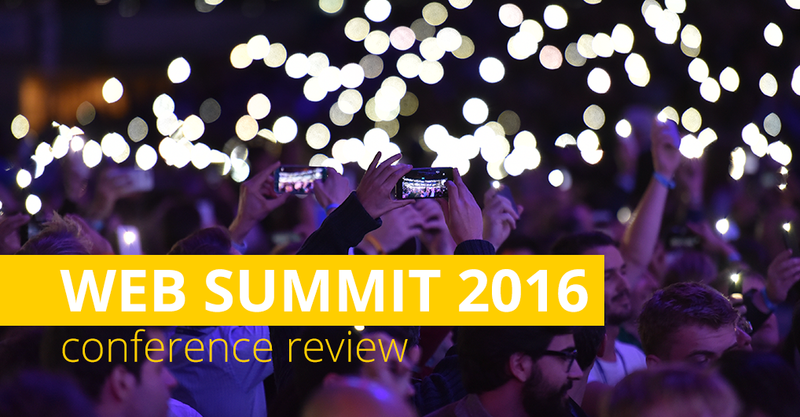 Aside from Mike’s speech, much of the conference revolved around VR. 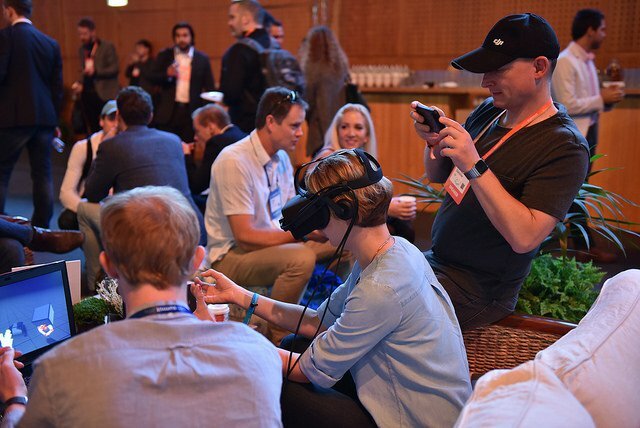 There are existing product you can buy (for example, Oculus Rift, that’s owned by Facebook), and in a click, experience a movie or a game impressively. In other words, aside from the experience of standing at the edge of a skyscraper’s roof, VR can also assist the injured to recover their body through simulation and brain stimuli. An inspiring lecture – especially the bits that showcased existing applications of things that up until recently were considered science fiction. The next interesting lecture I listened to was conducted by Autodesk’s CEO, Carl Bass – about the way we will design in the future. If we had access to every computing and processing asset there is – what would we do otherwise, to reach the best possible designed product? Autodesk had explored this notion by asking race drivers, what would they build differently if they had the freedom to design the racing car from the chassis up, and map it via computer. From there, they allowed the computer to make the decisions regarding the materials, the design of the chassis, stress tests and so on. After the processing, the program simulated the expected car. Even to the naked eye, the chassis looked reinforced exactly where most stress is applied. Next, to 3D printing, and the optimal product is ready. Autodesk’s vision is to leave the planning processes to programs, not only the production. Just like in the “Black Mirror” series – just in pink! The next talk was about ethics in every product you work on, Tristan Harris took on the subject of the Hippocratic Oath of designers and decision-makers in companies. During the process of the characterization, we’re essentially “hacking” the users’ minds and affect their decisions and the processes they undertake, guide and direct them to their proper destination. Where should we draw the line? When are these actions are unethical and nullify the notion of free choice? Something would necessarily sacrificed when trying to optimize the process or create a materially-inclined flow. Just how much is it justified to make the user sacrifice his spare time? A small hint: think of the message that Tinder and Facebook deliver by providing the ability to infinitely scroll. The climax of this speech was by asking the audience to optimize and save the user’s time. We should design products that allow the users to leave the screen as fast as possible, rather than stalling and making the user stay. In short, be the ones that help save time, and gain your users respectfully. Tristan had replaced the term “time spent” with “time well spent”. Give that a thought. What does your audience feel, and how do you fill their happiness meter? I went to the Happiness 2.0 panel by Pamela Pavliscak, founder of Change Sciences Group, Inc. She spoke about the attempts of product creators to tap into their users’ emotions, to the extent that such attempts become transparent to them as well. Take Facebook as an example. They have launched a more complex “line” of instant emotions, alongside the Like. Instagram attempt to do that with filters that convey a mood. There are even peripherals that reflect the player’s feelings in-game (a sensor attached to the player’s leg, making the in-game avatar reflect the current mood of the player). Pamela had defined a happiness model that consists of several key elements, whereas the main one is: instead of trying to answer every possible feeling, or try to make the user happy, provide the personal space that’d allow the user to express the particular emotion at the particular moment. In other words, there’s no need to contemplate what would make countless users happy – just give them “mental whitespace”. Meaning – a room free for mental flexibility and ease, in the form of white spaces, darkening the screen from time to time, or states in which the system tells the user that “everything’s been taken care off” and relieving the user of some stress. It appears that this mental whitespace correlates to the user’s happiness scale at the same time, and they would take it to the most appropriate place for them. Interesting. As a User Experience designer (UXer), I have felt the urge to attend the “Is UX opium to the masses?” panel. The premise was to examine the new products in the market, test their user experience and who does it truly serve. The bottom line? The actual experience is shaped by what the applications offer. For example, in dating apps, the sheer amount of engagement with the actual app is much greater than the amount of engagement it’s supposed to generate (getting people to meet in real life), or products such as Slack that became so popular, that users adjust themselves accordingly and not the other way around. Take that into account when you think of a product, because it’s likely that your users already have their habits. The lecture of Reddit’s founder, Alexis Ohanian, was a perfect example of that. The title was: “The Front Page of the Internet”, no less. Reddit itself isn’t pretty and obviously not ideal, and yet – it’s one of the world’s most popular websites. That’s why I was interested in hearing first hand why users linger there for so long. Reddit’s main advantage is that it provides a platform for anyone to conduct a nearly-anonymous conversation, almost about anything, while separating the actual identity from the online identity of choice. There are some very in-depth sub-reddits, with a pretty high anonymity level, in which you can talk just about anything, and even become an influencer and shape public opinion. Regardless if the topic is mustache grooming (mustache!) or other philosophical topics. So just how much creative freedom users allow themselves to take? “The homepage of the Internet” demonstrates just how much the self expression is pivotal to people in general and web users specifically. 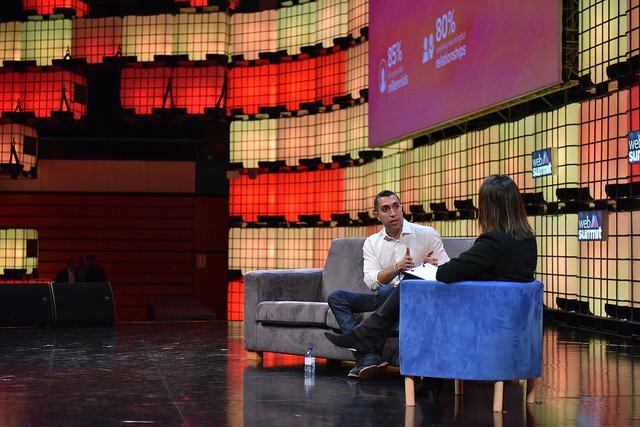 Tinder’s founder, Sean Rad, was interviewed in a panel that concluded the third day. Sean explained that even though Tinder appears to be “simple”, an entire methodology was developed to allow the app to become what it is today. Their purpose from the get-go was to find the essence of what the users seek to accomplish, and were able to reach that while breaking conventions in regard of the way people would normally look for a date. Things to learn from them? Plenty. The double heart concept, that answers the question whether two people are feeling the same. The realization they have reached after much research and sociological evaluations that people have developed “immunity” to fake photos, and that they react better to photos that are “sporty” by nature, for example. Additionally, they keep on constantly testing the behaviors of their users, so they could improve the odds of helping their users to find a successful date. Eventually, Sean’s main tip is to be real (which is also true for social networks in general), because data confirms that as fake the content is, the less interaction will it get, because users grew smarter than before. 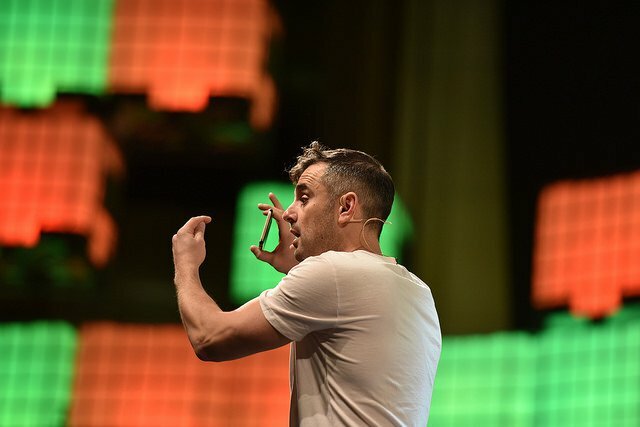 In the last day, a speech that caught my eye was about “Afraid to fail because of other people’s opinions?” by the Internet celebrity Gary Vaynerchuk. What is there to say? The guy’s energetic, has a hard-to-pronounce surname and is full of motivating content. As the name implies, Gary spoke about the fear of letting other people down. The message is – get up, do, disappoint whoever’s to be disappointed, whatever. It’s all about doing! Go out, be entrepreneurs, be specialists, be accomplishers, but do. Granted, sometimes the effort would be substantial, but “you’ll own it”. In his words: “that’s the best time to live in”. His speech was ornamented by various sayings such as: stop complaining, in the end “no one cares” (had to tone the original phrasing down a bit :)) so be brave. Indeed an empowering presentation for every entrepreneur or employee that lacks some confidence, and it sets a pretty high bar for presentations in general. If you ever find the chance, I’d recommend seeing him live, if only for the energy. Who played Pokemon Go? All hands were raised. Who still plays Pokemon Go? Only one member of the audience WOO-HOOs. That’s surprising, because the game’s estimated income is still $1.5M a day from IAPs, with more countries it’s being unlocked to on a weekly basis. 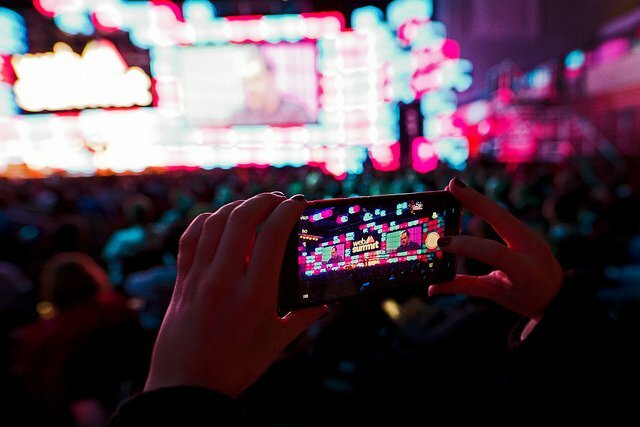 Granted, it’s an AR game that generated a great deal of hype, but to remain successful – is the real art. Mike had told the audience about what was going on behind the curtains, about the efforts to make it into a MMO (a massively multiplayer game – and not a passing craze), and told about the success despite the connectivity issues. When he was asked about the criticism the game’s getting about guiding players into traffic, Mark explained that they are hard at work in effort to balance out the game. Regarding monetization and IAP, players seem to hate allegedly free games, in which you are obliged to make IAPs to proceed. Those games are dubbed P2W, pay-to-win. Pokemon Go has purchases of course, but not in an experience-crippling way, and the players appreciate that. The yearning to become MMO, inclusion of AR, support from Google and reasonable monetization – Niantic seem to had figured it all out. The next interview tried to answer the question: does statistic data regarding your workout habits help in making you a healthier individual? 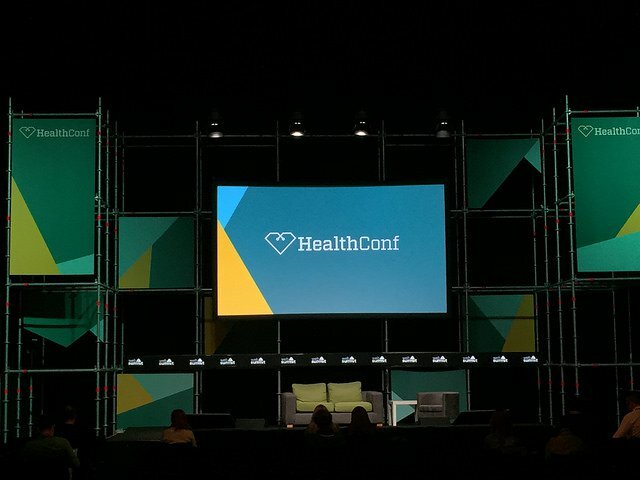 To answer it, FitBit’s CEO took the stage, a company whose products I use daily and like. He had elaborated that their biggest challenge is to get users to keep on using the fitness tracker, while changing habits and eventually keeping the fitness tracker from the drawer. The solution that they had offered is to showcase plenty of useful data, accessible to the user, in an easy-to-share-and-compare manner. The secret lies not in the collection of data, but in displaying it properly. Moreover, they are constantly seeking new methods of making the data relevant for the user. For example – recommendations for routine changes, or defining reasonable personal goals. The message became even clearer at the talk named “Impacting behavioral change – A look at successful user stories”, featuring Mike Lee from Under Armour and Ciara Byrne from Fast Company. They discussed MyFitnessPal, a platform that allows athletes to track their diet, activity and so on. They concluded that users who are able to “make themselves” use the application regularly, clearly manage to improve their health and athletic achievements. Obviously, the “regularly” bit is the tough one for many users, an issue Mike phrased: “the challenge of connecting with analog people in a digital era”. The ways to inspire people include a fair amount of gamification, inclusion of step counters for a more day-to-day experience and so on. Slowly, the influence becomes substantial and the data finds its way into the personal decision-making process of athletes. That way, they claim they can help just about anyone accumulate perseverance and create correct and healthy habits. In between the speeches, you get to soak in a lot of peripheral knowledge. 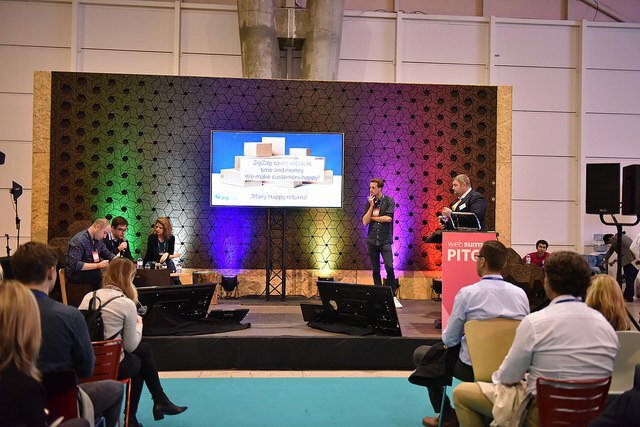 I have had the chance to attend presentations in the pitching panel, where startups in various stages presented ideas. For investors, there are many alpha and beta areas, booths in which they can hear ideas of people from all over the world about their products or just be inspired with new ideas. 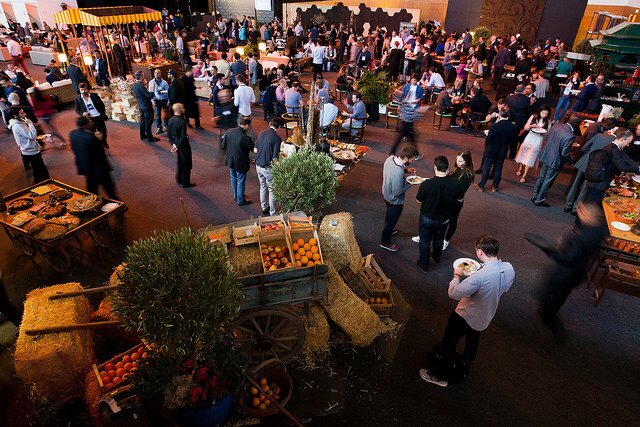 In conclusion: plenty of people, tons of lights, networking and wonderful playlist. 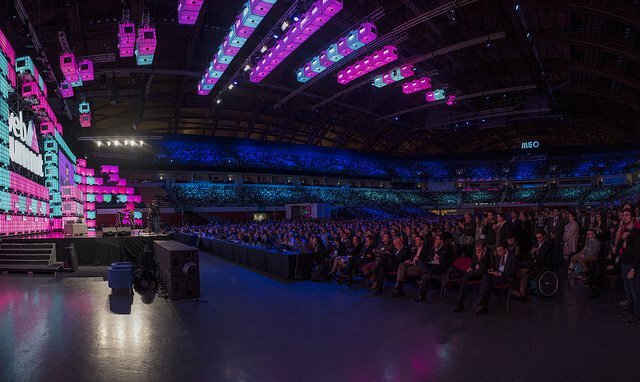 If you’re attending next year, be prepared for an overwhelming and rich experience. Good luck! All images are taken from the conference’s Flickr page, and displayed under the CC BY 2.0 license. This review was originally published in Geektime.